I would like to receive occasional information and updates from SPINAL RESEARCH UK CHARITY AUCTION and jumblebee. I’m getting involved after years of watching my godfather promoting the charity and the great work they do following his unfortunate injury in 2002. He was involved in a car crash and lost all feeling from the neck down, however, following rigorous treatment and physio for the intervening 16 years, now has a range of movement from the waist up. As someone who has experienced the fantastic work of Spinal Research first hand, he cannot praise them enough. He has been lucky enough to have the support of charities like Spinal Research, and I would love more people to be able to benefit from such great treatment. The work Spinal Research does in funding and supporting pioneering new treatments is key in the continuing battle to make spinal injuries non-permanent. Spinal Research is the UK's leading charity funding over 140 research projects around the world. Thanks to their innovative research, paralysis can now be treated and scientists stand on the brink of applying therapies that will restore movement and feeling to transform the lives of people living with paralysis. Anything you are able to give will make a huge difference, especially as Spinal Research receives no government funding so any donation will be really meaningful. 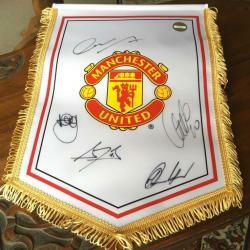 For those of you who may be interested, as part of my fundraising, I am running this charity online auction for Spinal Research. There have been some really generous donations already including support from across the sporting community from the Brownlee brothers, Aston Martin Red Bull Racing and Williams F1 amongst others! Bids will go live in early April. If anyone would like to donate or sponsor a lot, please get in touch. The winner will also receive a certificate of authenticity. 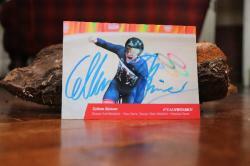 Callum Skinner, Team GB Cycling Olympic Champion, has donated a signed autograph card. 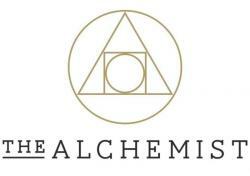 The Alchemist has donated a meal and cocktails for 2 at their bar on Greek Street in Leeds. 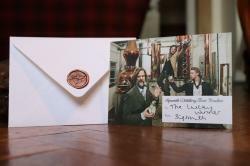 Sipsmith have donated 2 tickets for a tour and tasting at their London gin distillery. The PDC and Barry Hearn have kindly donated a pair of tickets to the Darts at the O2 in London for the Premier League Playoffs on Thursday 17th May! The top four players from the final league table qualify to compete in the Play-Offs at The O2, which will see the event's 2018 champion crowned on May 17 with the semi-finals and final in one evening. The 2017 Play-Offs proved arguably the most dramatic in the Premier League's history, with Wright knocking out the legendary Phil Taylor in their semi-final before missing match darts in the final as Van Gerwen reclaimed the trophy. 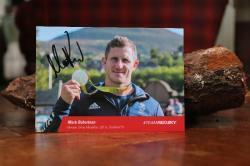 Olympic Silver medalist in Rugby 7's, Mark Robertson, has donated a signed autograph card. 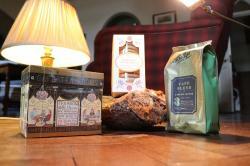 Local Ilkley café Betty's have donated a tasty prize from their master bakers and chocolatiers. 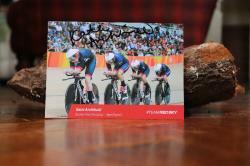 Team Pursuit Olympic Champion, Katie Archibald, has donated a signed autograph card. 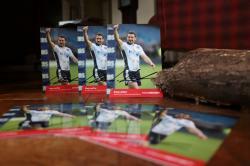 Greig Laidlaw, current Scottish Rugby scrum half and former captain, has kindly donated some signed autograph cards. 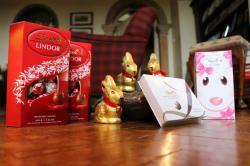 There are 6 available at £5 each. Love supercars? If the answer’s ’yes’ then Supercar Sunday is the event for you! The home of British Racing, Silverstone, have donated 2 adult tickets for the 2018 British GT Championships on Sunday 10th June. The winner will enjoy a packed grid of GT3 and GT4 cars, featuring the likes of Aston Martin, Ferrari, Lamborghini and Bentley, will battle for three hours around the world famous venue’s full GP configuration. Meanwhile you can see hundreds of supercars, not to mention thousands of horsepower, descending on Silverstone as part of the Supercar Sunday display. Surround yourself with the world’s finest production cars, take part in Sunday’s pitlane walkabout and driver autograph session. That’s all in addition to the amazing on-track action, which this year features BRDC British F3, Ginetta Juniors, Mini Challenge, Caterhams and of course British GT! As a bonus, you can even take any children under 15 for free! 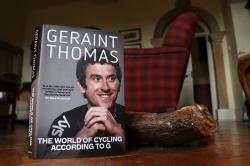 Team Sky and Team GB 2 x Olympic Gold Medallist Geraint Thomas has donated a signed copy of his autobiography. Geraint was the first Welshman to wear the Yellow Jersey in the Tour de France. 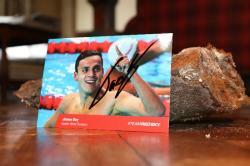 James Guy, double Swimming World Champion in 200m Freestyle & 4x200m Freestyle, has donated a signed autograph card. 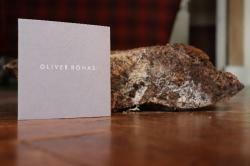 Oliver Bonas have donated a £20 gift voucher for any of their stores. Sir Chris Hoy has signed a Team GB replica cycling jersey for Spinal Research. Chris Hoy became Great Britain’s greatest ever Olympian at the London Games when he won his sixth gold medal. The Scot won his first Olympic medal in Sydney 2000 and his first gold in the kilometre TT in Athens 2004. He then hit the big time when he won three gold medals in Beijing and returned to the UK as a national hero and instant sporting celebrity. Hoy won two more gold medals in London to surpass the tally of rower, Sir Steve Redgrave. Hoy retired in early 2013 but still works in the cycling industry. He launched his own range of bikes with Evans and works to promote cycling. The velodrome built in Glasgow for the 2014 Commonwealth Games was named after him, although Hoy is himself from Edinburgh. Cineworld have donated a pair of tickets to see any film at any of their UK cinemas! 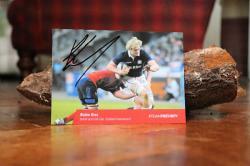 Scotland Rugby player Richie Gray has donated a signed autograph card. The Ilkley Tennis Open have donated 2 tickets to Ladies day on Thursday 21st June 2018. The Ilkley Trophy is one of the most prestigious UK tennis grass court events, with top ranking players from all over the world competing in both singles and doubles. 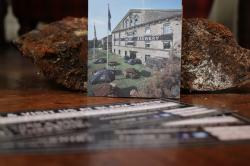 Black Sheep Brewery, in Masham, have donated 2 tickets for a tour of their brewery - there's plenty of tasters! 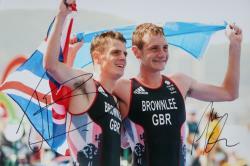 The local Brownlee brothers, Alistair and Jonny, have donated this signed A4 photo of them competing for Team GB at the 2016 Rio Olympics. Alistair won gold at the London 2012 and Rio 2016 Olympics, while Jonny won Bronze and Silver medals. Jonny was World Triathlon Champion in 2012, with Alistair winning the title in 2009 and 2011. They are local athletes and very generously got involved. 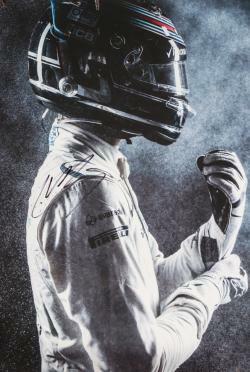 Williams Martini Racing F1 team print signed by their Canadian driver, Lance Stroll. The team supports various Spinal injury charities including the Spinal Injuries Association. 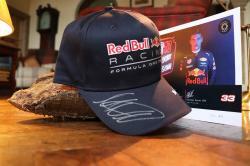 An Aston Martin Red Bull Racing F1 team cap signed by star Formula 1 driver Max Verstappen.